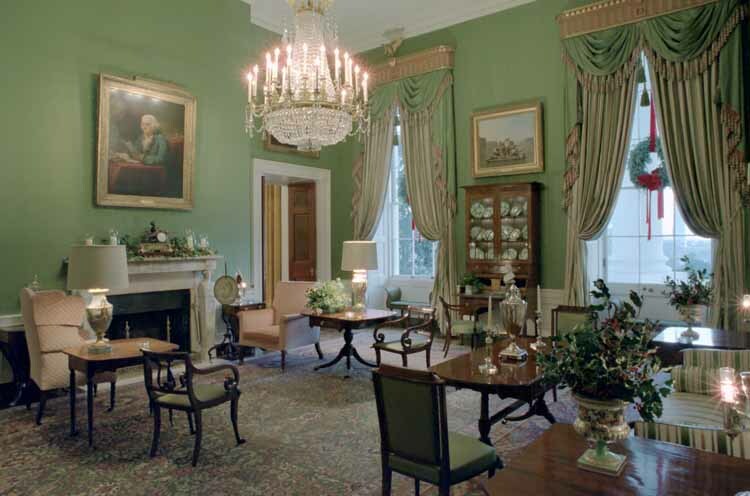 Furniture by and attributed to Duncan Phyfe, including a secretary-bookcase beneath an oil by George Caleb Bingham, fills the Green Room of the White House. Duncan Phyfe. Taken aside the question of how his last name should be spelled (Phyfe is correct by the way), his style of furniture has come to be instantly recognizable and his admirers and detractors legions. Who was this man and why do people have such strong feelings about his furniture? A New York cabinetmaker, Duncan Phyfe (1795-1856) made fashionable furniture for the carriage trade of the day. Phyfe was born in 1768 in Loch Fannich, Scotland, and immigrated with his family to Albany, New York in 1783. It is believed he served an apprenticeship in Albany before moving to New York City around 1792. Part of the red hot passion surrounding Phyfe is due to the fact that there is no actual “Duncan Phyfe” style of furniture. Early Phyfe pieces were American interpretations of European and English Louis XVI, Adam, Hepplewhite, Directoire and Sheraton styles. Because there is so much similarity between the styles, they are often lumped together under the name Early Empire. Here in the United States, the style became known as Federalist. It was in this early period that Phyfe’s genius as a furniture maker was evident. As one writer noted “Phyfe’s work was as good in design as that of the great English cabinet makers of the eighteenth century.” His strength in furniture design was in his fine sense of proportion and his restrained use of decorations. Phyfe was particularly noted for his furniture’s graceful, flaring lines and his ability to employ such subtle curves that sometimes they appeared straight. Among the more distinctive attributes of Phyfe’s pieces is the lyre shape, which appears on chair backs and pedestal supports, and the tripod table. Popular motifs which appear throughout his work include lion’s paws, and natural elements such as wheat, leaves, and rosettes. His favorite medium was mahogany because his designs required a wood with both lightness and strength. Almost all of Phyfe’s furniture from his early period is made of mahogany. Phyfe was also one of the first American cabinetmakers to successfully use the factory method of manufacturing furniture – at one point he had almost 100 working craftsman in his shop. In 1837 he took two of his sons, Michael and James, into partnership as Duncan Phyfe and Sons. The firm name was changed to Duncan Phyfe and Son after the untimely death of Michael. Many of New York’s leading citizens were his customers, and several examples of Phyfe’s early work are in the Metropolitan Museum of Art. The Green Room of the White House also contains pieces of Duncan Phyfe furniture. Most would agree that Phyfe’s fine, well-constructed and tastefully executed furniture declined as later Empire styles became popular. Furniture designs in his final period became heavy, over ornamented and to a great degree characterless. Phyfe himself summed up the quality of his firm’s late work with the phrase “butcher furniture”. Phyfe’s imprint upon the furniture of New York was so great, that literally hundreds of pieces made by other cabinetmakers are attributed to him. Today, though many examples of actual Duncan Phyfe furniture remain, there value is likely to be in the thousands of dollars. A Duncan Phyfe sewing table, for example, was listed on the Internet for $93,000. What some antique dealer s refer to as Duncan Phyfe may actually be a Sheraton style piece of furniture or should be more accurately termed “in the style of” Duncan Phyfe. As with anyone who as seen great success, both the best and the worst of his style came to be exemplified. Whether you love or despise his style of furniture, Phyfe’s genius at creating a look that was uniquely American and mass producing it will forever ensure his legacy. How fascinating! This was a well-written piece, thanks for the article. Thank you, I’ve just been looking for info about this topic for a long time and yours is the best I have found out till now. However, what in regards to the conclusion? Are you certain concerning the source?